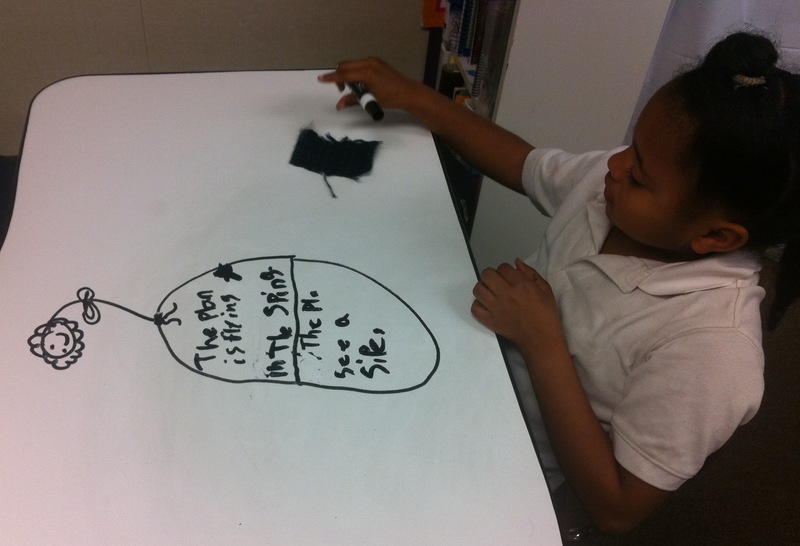 I have had so much interest via Twitter and my blog about the whiteboard desks that I thought I would write a follow-up post before the school year starts up again. For those of you who aren’t familiar with the project, you can read my old post here. To answer some of the questions I’ve been asked pretty often: I got the IdeaPaint through Donorschoose.org. It cost about $175 per 50 sq feet and in order to cover 20 desks, one horseshoe table, and one door it took 3 cans of IdeaPaint, but only one can of primer. It took me a half hour to prime the desks after sanding them and scraping off the tape, followed by an hour of wait time before applying the second coat of primer. After the second coat of primer had dried and I had sanded again, I mixed and applied the IdeaPaint. Finally, and this is the hardest part to do and plan for, I left the desks untouched for SEVEN DAYS. Yes, it takes at least seven days for the paint to fully dry. If you use them early, the ink will not fully lift off the paint and it will be permanently inked. If you’re doing this during the year, you could paint a set of desks at a time, but then you have to plan where the students will work during that time and you have to think about how to ventilate the classroom during that week. It only smells odd for a couple days, but it still is not something you want to sit and breathe all day. Otherwise, I’d recommend doing this during summer or right before winter or spring break. 1) A note left for my class when I was out. 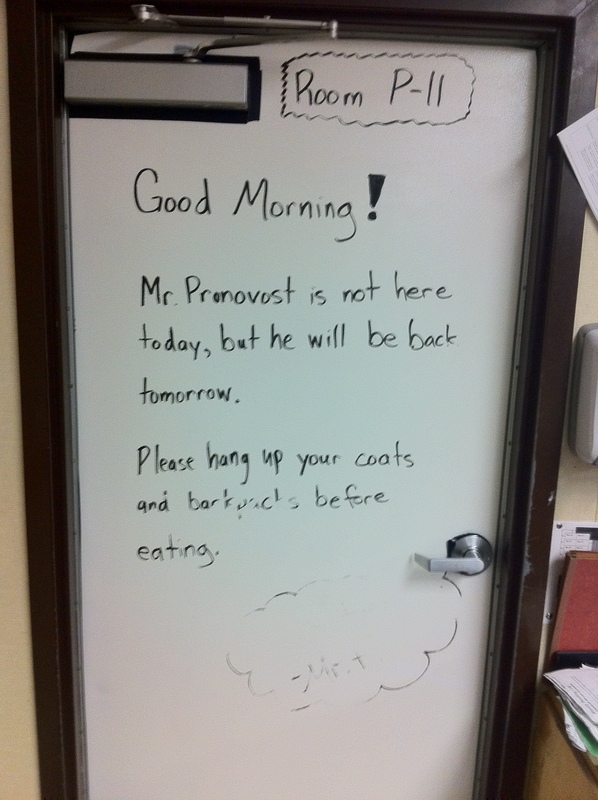 When I knew I was going to be out for whatever reason, I would leave a note to my students on the door. That way I knew everyone would see it before they entered the class. No questions about what they were supposed to do or where I was. I also leave all my plans and assignments on the back table, with notes written on the table detailing when that part of the day was supposed to begin and where finished products go. Additionally, if I know ahead of time that someone from the district office is visiting my classroom, I will write a note to them on the door. They don’t usually talk to the teacher when they enter the classroom, so I want to make sure they understand what we are doing and how it connects to the standards and our curriculum. 2) Free poetry. As you can see, the desk allows even more freedom than a piece of paper when one considers the poetry a student can envision creating. 3) Following along with the lesson in class. While I’m on the board going through the Open Court “Word Knowledge” section, students can copy down the sentences and identify things on their own. While I’m not the biggest fan of some of the rote “Word Knowledge” work, students love working on the desks along with me and one would assume it cements the learning a little more than just sitting there and taking it in as the curriculum suggests. 4) Running records. Rather than waste a whole bunch of paper taking running records on my students’ reading fluency, I can do it all on the table. I take a photo, save it to Evernote, and there I have a catalog of all my students’ running records with very little paper used. 5) Active involvement in small group guided reading. I had always asked students to ask for help clarifying words or concepts they didn’t understand in a story. Yet I had one out of ten students willing to actually ask to clarify something. Once I asked them to write those words or questions on the table, participation rose dramatically. It went from one student in a group asking one question to each student asking numerous questions. Which shows how little students were understanding before, or at least how much more they feel comfortable asking for clarification with this simple change. 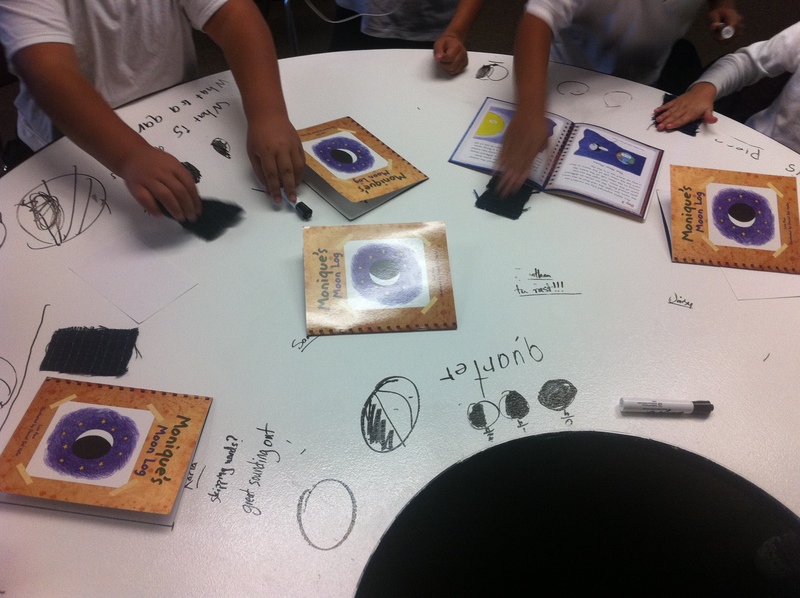 As you can see, we also went into the cycle of a moon during this small group session and students were able to copy the cycle from the book as we discussed it in detail. So how much has it increased learning and participation in my classroom? Much more than anything else I can point to. Enough that I am going to scrape 80 dollars (make that $70 thanks to a wonderful donor on Twitter – thanks @Matt_Arguello!) together to buy a smaller can of paint to apply to the four extra desks (for the four additional students) I will be adding to my classroom this fall. Well, $70 and the hours of sanding and painting. But it is well worth it. 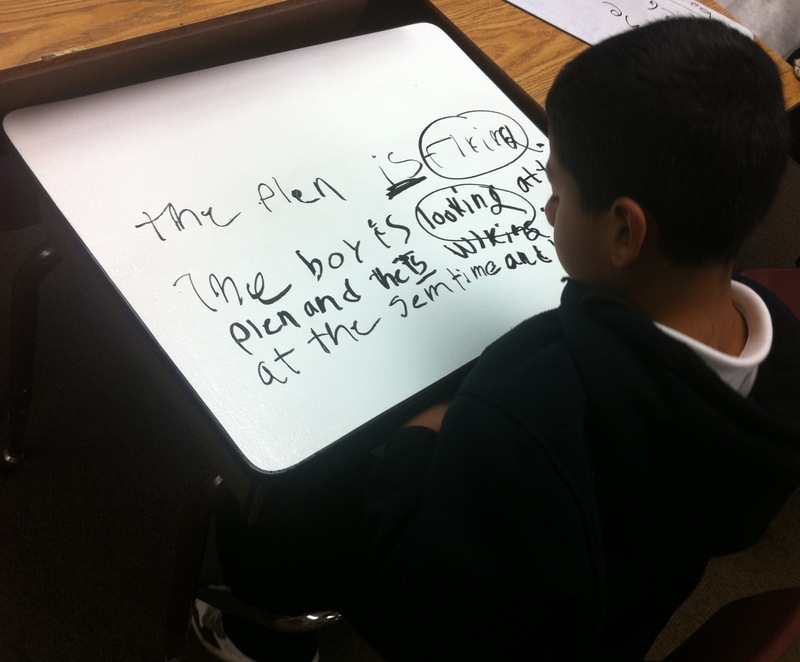 This entry was posted in Classroom Excitement, Whiteboard Desks and tagged Donorschoose.org, IdeaPaint. Bookmark the permalink. I love this but would use cheaper paint. I redid my chalkboard with Ideapaint and I did something wrong and it didn’t work out. I couldn’t afford another 175 dollars so I tried the 20$ version from Menards and it worked fantastic and only took 2 days to dry. Exactly what I do… in fact, I was inspired to write a follow-up to this follow-up, and your reply convinced me to do it. Robert, these are great pix and a great post! The creativity is oozing off of those tables, and I think everyone’s horseshoe table should be whiteboard– look at how easy and just… inviting it is to do things like running records on! Absolutely genius. I’d just plan on painting them before Winter or Spring break or at the very end of the year (providing I was returning to the same classroom in the Fall.) That way no problem with the 7 day wait. I completely agree. I did it the Friday before Spring Break and it worked out well. I’m too lazy. We just write on our old desk tops just the way there are. Clean up is a breeze with a baby wipe. Definitely a possibility for many desks, but I was worried about the precedent that sets for them in future classes and trying to keep the kids from getting in trouble in future years for something that was quite fine in my room. 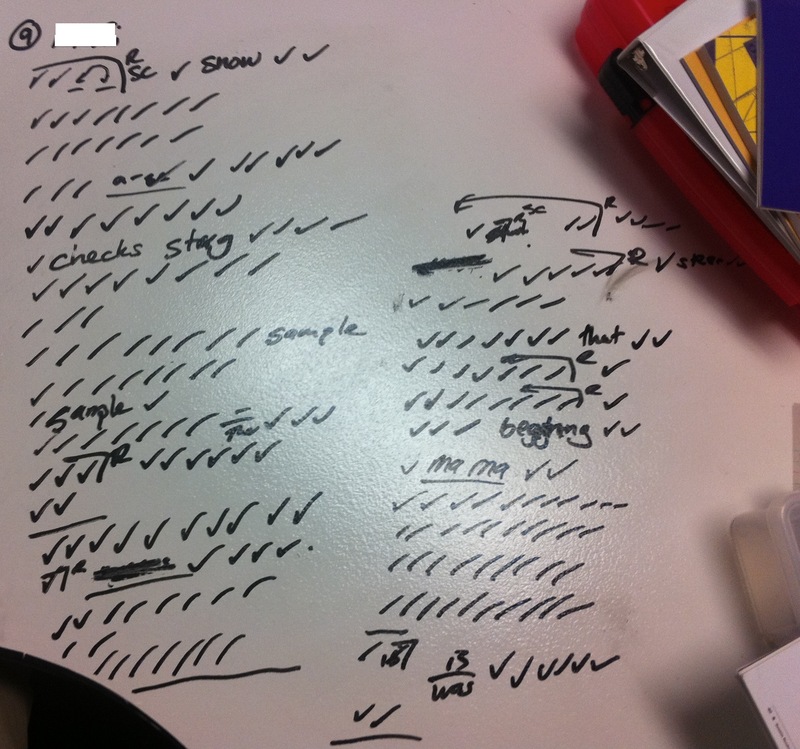 I’m just wondering – has the novelty worn off with the whiteboard desks or do you still think it is a good idea? I teach high school – and am thinking about this, but I’m considered the kids would get bored with it. Also, after two years – how well has the product held up? To be honest, I moved to the district office and haven’t used the whiteboard desks since, but I know they are still in use and seem to be doing well. Those that have ghosting are due to low-odor pens or not erasing regularly. And as far as novelty goes, I am continually adding whiteboards and whiteboard paint in our rooms (like our new Makerspace) and have colleagues who have installed the paint or showerboard with great success as well. I’d be happy to try to connect you to others who are doing this as well if you’d like. How did you keep students on track from not drawing all the time? Did you ever have a problem with kids intentionally trying to ruin the paint? Taking a pencil to it or worse a pair of scissors to scratch it? I am looking to get extra collaboration space in my room and my principal wants me to try the extra tables from our LRC instead of desks. Just wondering about the wear and tear, other than the ghosting, did the paint chip, get marked by the normal student use? There were some chips on the edges, which led to me wrapping the edges of the desk with colored tape. I bought whiteboard tables for my programming class. Students love to sketch out their pseudocode on the whiteboard. It makes the work seem authentic.